"I have here in my hand a list of 205 people that were known to the Secretary of State as being members of the Communist Party, and who, nevertheless, are still working and shaping the policy of the State Department." But the Red Scare didn't start in 1950. 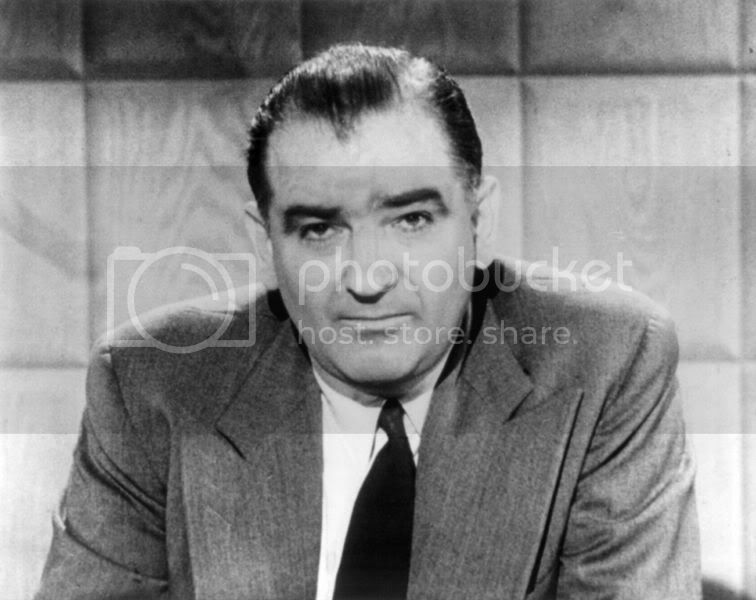 McCarthy was just an opportunist taking advantage of an atmosphere of hysteria. In fact it didn't start in June 1948, when the Soviets blockaded Berlin. 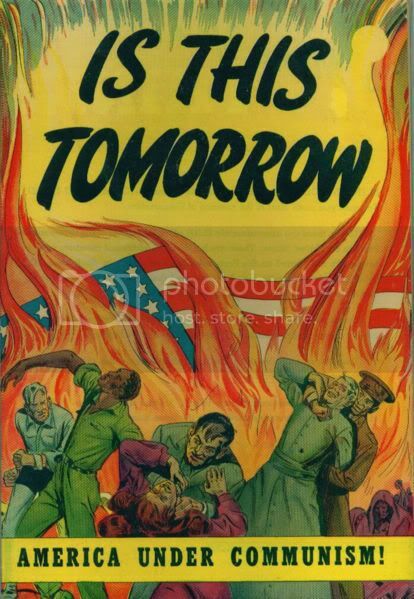 Instead the official start of the Red Scare was October 1947. The place was the House Un-American Activities Committee. What were the two questions that the HUAC asked all their unfortunate victims in 1947? Sure, you all know one of the questions. That's an easy one. But what was the first question that was asked of the witnesses? Mr. STRIPLING. Mr. Scott, are you a member of any guild, either the Screen Directors Guild or the Screen Writers Guild? Mr. SCOTT. I don't think that is a proper question, Mr. Stripling. Mr. STRIPLING. Were you ever a member of the Screen Writers Guild? Mr. SCOTT. Mr. Stripling, I repeat, I don't think that is a proper question. Mr. STRIPLING. Are you now or have you ever been a member of the Communist Party? Notice how time and time again, the first question asked wasn't "have ever been a member of the Communist Party?" Instead their first question was "Were you ever a member of the Screen Writers Guild?" I don't know about you, but the Screen Writers Guild doesn't exactly strike fear into my heart. I can't imagine many Americans fearing the power of this little union either. So who made the Washington politicians so fearful of this union? To answer that question we must go back to 1941 and an almost entirely forgotten piece of American labor movement history. 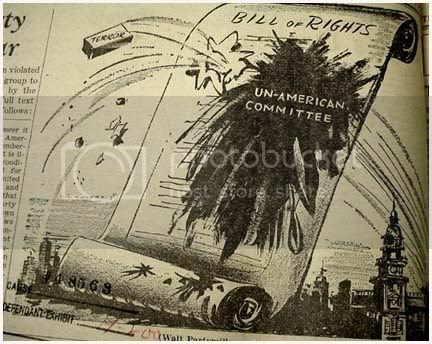 This House committee was first created in 1934 and was called the "Special Committee on Un-American Activities Authorized to Investigate Nazi Propaganda and Certain Other Propaganda Activities". It died out that year without uncovering anything significant, but not before it shifted its focus from fascists to communists. It was recreated in 1938 under the shorter and more familiar name and was chaired by Martin Dies (known then as the Dies Committee). It's purpose was to investigate German American involvement in Nazi and Ku Klux Klan activity. Shortly after its creation, the HUAC's chief counsel Ernest Adamson announced, "The committee has decided that it lacks sufficient data on which to base a probe." Committee member John E. Rankin added: "After all, the KKK is an old American institution." So instead of investigating the Klan, the HUAC decided to investigate communist influence in the Federal Theatre Project. This is very ironic because the Dies committee was co-chaired by Samuel Dickstein, a man who turned out to be on the Soviet payroll. The Federal Threatre Project was a New Deal program designed to put unemployed actors to work. Many of its plays were pro-union, and because of that it got shut down in 1939. 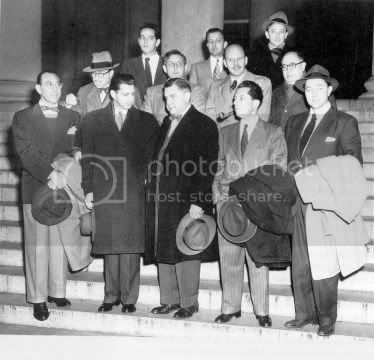 Before its demise, Hallie Flanagan, the head of the Federal Theatre Project, was forced to appear before the HUAC to answer charges that the project was overrun with communists. It was a precedent. In 1946, a sharp, post-war recession allowed the Republican Party to sweep into power for the first time in over a decade. That year was also the year that the HUAC, which had expired in 1944, was renewed and made permanent. The GOP had been seething in silence over the leftist trend in American politics for 13 years, and now they finally had the gavel. Someone was going to pay, and those someones were armed with nothing more than pencils. The official reason for the HUAC to create what would be known as the Hollywood Blacklist was because of reports that Hollywood was placing subversive messages into Hollywood films. The claims were never proven, but then the targets of the investigation (labor unions), and the witnesses for the prosecution (studio owners) told the real story anyway. Only 25% of those blacklisted were actors. You see, by 1947 Hollywood had already experienced an upheaval of bitter labor disputes. Starting in 1938, the motion picture industry began to get unionized. MGM, Paramount, and many other studios began signing labor contracts. Max Fleischer fought it, but watched his studio sink into bankruptcy because of his fight. Leon Schlesinger locked out his Looney Tune artists when they tried to unionize, but surrendered after six days. Walt Disney studios remained the last large non-union studio, but it was a prime target for unionization. Animator salaries ranged from $500 a week to $12 a week. Royalty checks were promised, but never delivered, when times were good. When times weren't good there were layoffs. Enter Arthur Babbitt. Babbitt was the creator of Goofy and the Wicked Witch. He was one of the best paid and most respected animators at Disney studios. But he also had a strong sense of what was right and took up the union cause. Many top artists followed his lead. Walt Disney fired Babbitt in violation of the federal Wagner Act and had him thrown off the grounds. On May 28, 1941 Disney artists held a mass meeting and the motion to strike was made. The strike drug on and hard feelings set in. Some of the artists drifted away to start new projects (that became such items as "Dennis the Menace" and "Mr. Magoo"). Eventually Pearl Harbor happened and striking was outlawed. Opposing artists were forced back to work for he Army Motion Picture Unit. Walt would never forget, either. He continued to resist rehiring Art Babbitt until a federal judge forced him to. 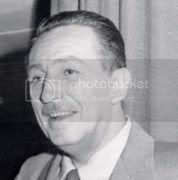 When the House Committee on Un-American Activities (HUAC) began to investigate communist infiltration in Hollywood, one of the first wittnesses to testify was Walt Disney (October 24,1947). He charged the animator's union and the League of Women Voters was subverting the spirit of Mickey Mouse with Communism! Babbitt joined the army and saw combat in the marines. While you and I fail to see why Hollywood labor unions would be a threat to us, Walt Disney could. Do you think Republican politicians, casting around for a boogyman to slay, would listen to a rich, campaign contributor like Disney? Labor activity ceased during WWII, but once the war ended strikes returned. And boy did they return. The studio strike of 1945 had it all. Corrupt union bosses, movie moguls, gangsters and trade unionists. The first thing to remember was that in 1945 there were two unions in Hollywood. 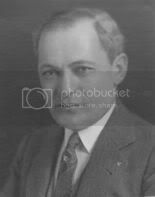 One was the IATSE, led by President George E. Browne. The IATSE was straight out of Chicago and was literally affiliated with Frank "The Enforcer" Nitti (the successor to the Al Capone crime syndicate). Browne was sentenced to eight years for federal racketeering in 1941, but not before signing contracts with most of the major studios. The IATSE promised low wages and no strikes in exchange for lots of illegal money. Richard Walsh took over for Browne. Some members launched a rebellion against the IATSE in 1939 and formed four smaller unions. The other big studio union was the CSU, the Confederation of Studio Unions. The CSU, unlike the IATSE was a democratic union with no links to the mob. The CSU President was named Herb Sorrell. 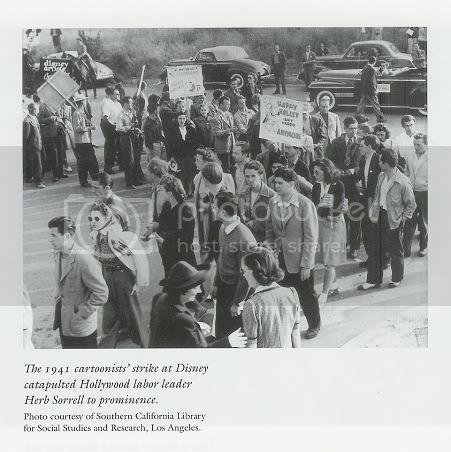 Sorrell came out of the Disney strike of 1941. In 1943 a group of set directors broke away from the IATSE to a form a small union and voted to affiliate themselves with the CSU. The producers stalled the contract until the IATSE came in and claimed juridiction over the set directors. An arbitrator was appointed and ruled in favor of the CSU. The producers continued to refuse to recognize or bargain with the set directors, and in effect, this started the studio strike of 1945. On March 12, 1945, the strike began. 9,000 CSU workers walked off the job while IATSE president Richard Walsh ordered his 16,000 members to cross their picket lines and go back to work. The studio heads lined up with IATSE. The Writer's Guild, Cartoonists and CIO voted to honor CSU pickets, the Screen Actor's Guild, the AF of L and Teamsters to support IATSE. 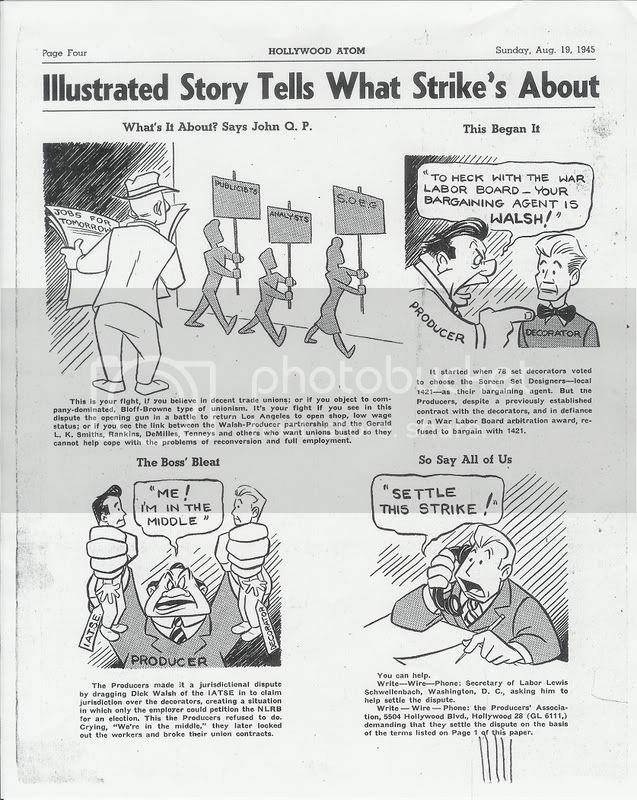 Notice how the Writer's Guild supported the strike, while the Screen Actor's didn't. Then remember who the targets of the HUAC witchhunt were just a few years later in 1947. Despite threats of having their cards revoked, thousands of IATSE workers refused to cross picket lines. A meeting of IATSE rebellious workers was broken up, and the leaders were suspended from the union. The strike was poorly timed. The studios had 130 films on the shelves - a nine month supply. The major studios augmented their security by hiring goons ( all granted LAPD licenses to carry guns) and actually put moonlighting LAPD and Burbank police on the payroll. The LAPD also had a unit called the Red Squad, who's duty was to kick in the doors and harass suspected communists, union organizers and other undesirables. Disney, Monogram, and some independents bargained with CSU Local 1421. Columbia, RKO, Universal, Fox and Warner Bros. did not and were affected most severely, with MGM and Paramount right behind. After several months, movie productions begun to shut down. But the workers and the CSU began to run out of money around the same time. CSU President, Herb Sorrell, decided to make a stand at Warner Bros. On October 5th, some 300 strikers gather at Warner Bros. main gate at 4 A.M. on a typically warm day during this pivotal month. Shortly thereafter, strikebreakers, Chicago goons and county police attacked. They were armed with chains, bolts, hammers, six inch pipes, brass knuckles, wooden mallets and battery cables. The county sheriffs marched two and three abreast, steel-helmeted and reinforced with tear gas masks, and night sticks, Some carried 30-30 Garrand rifles and two were weighted down with an arsenal of tear gas bombs. 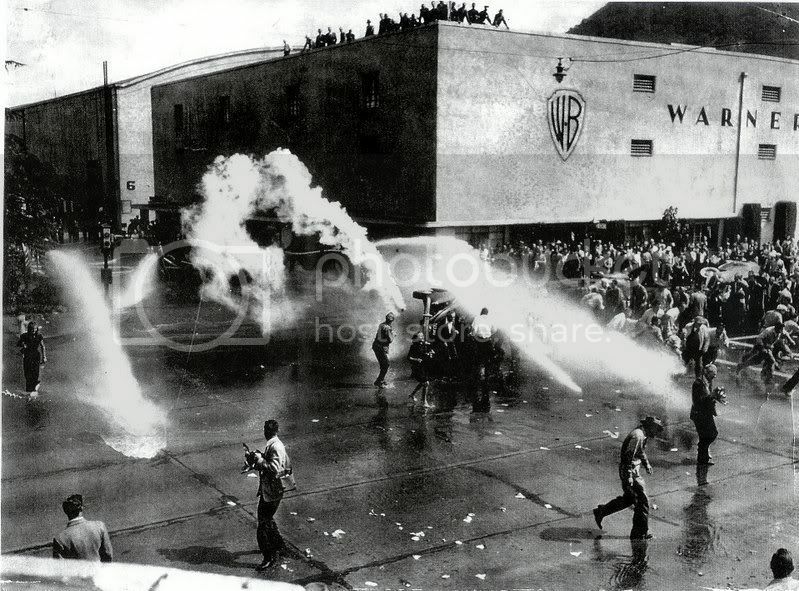 The Warner Bros. studio police lobbed canisters of tear-gas from the roofs of the buildings at the entrance. SU pickets had their own "white-painted air-raid warden helmets" that shone eerily in the predawn gloom. These helmets and weapons added to the perception that this strike had become a pitched battle, a war. As Sorrell recalled it, "First, they drove through the picket lines at a high rate of speed, several cars. I think we took four people to the hospital. The fire hoses were dragged out; they turned them on the people's feet and just swept them right out from under? they threw tear gas bombs? there were women knocked down? It was a slaughter." By the end of the day, some 300 police and sheriffs had been called to the scene and over 40 casualties were reported. The picketers returned the following Monday with an injunction barring the police from interfering with the strike while Warner retaliated with its own injunction limiting the number of pickets at the gate. Violence continued all week. The CSU was breaking, but the bad publicity from this event forced the studios to make a tentative agreement. The agreement was a farce. IATSE members who supported the strike were locked out. IATSE scabs were pushed out of the CSU jobs they were filling, but the studio held onto them. On September 23, 1946, the studios reassigned all the CSU members from construction supervisors, foremen and maintenance men to work as journeymen carpenters on "hot set", a position many of these men hadn't worked in many years and a violation of their job descriptions and cause for a union grievance. These men understandably protested and refused at which point they were given prepared paychecks for their time and effectively sent home and subsequently locked out. Naturally, the pickets went back up, and the CSU was forced to assume the crushing burden of another strike. The Screen Actor's Guild turned their backs on the CSU, and after another 13 month strike, the CSU had been crushed for all time. Walt Disney fired Arthur Babbitt, the famed animator and creator of Goofy, for trying to form a union? These animators were making Walt Disney tons of money. Without their skills Disney would be worthless. I've lost the respect I previously had for this man. The documentaries I've watched on TV never mentioned these facts.